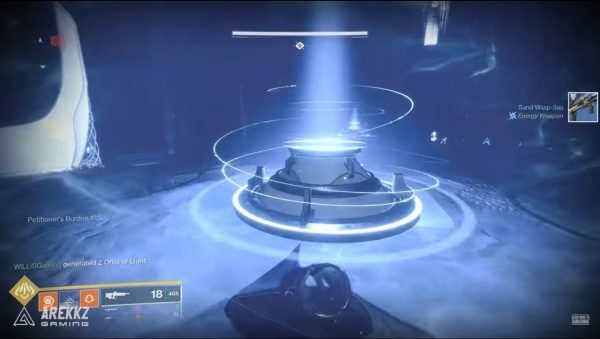 The Shattered Throne is sort of like a mini raid that can be completed by a team for three and a Triumph will pop at the end. Bungie has previously said it would be delivering fresh new content on the reg, and The Shattered Throne definitely delivers. The Shattered Throne appears in curse week, so you can plan ahead to try and complete it and find the Wish-Ender Exotic bow. There’s a good chance you’ll need to complete The Shattered Throne as part of the Mysterious Box quest, so make sure you check out our guide first. Enemies towards the end of this mission are in the region of 590 Power so whilst there’s no recommended Power level, we’d recommend making sure at least one of your party is in the region of about 570 Power. You’ll be rewarded with some powerful gear at the end and will hopefully give you the Power boost you need to start the Last Wish raid. Here’s our guide to completing The Shattered Throne complete with a walkthrough video from our buddy Alex from Arekkz Gaming. There aren’t any prerequisites for this mission, simply head to The Confluence by either going through the portal near the Oracle Engine or by travelling to the Northwest section of the map, through Harbinger’s Seclude. Work your way through the city, jump down the elevator shaft and once you land, take a right and go down the corridor and through the portal. Once you’re through, follow the corridors all the way to The Confluence down one of the doors will be a giant portal. 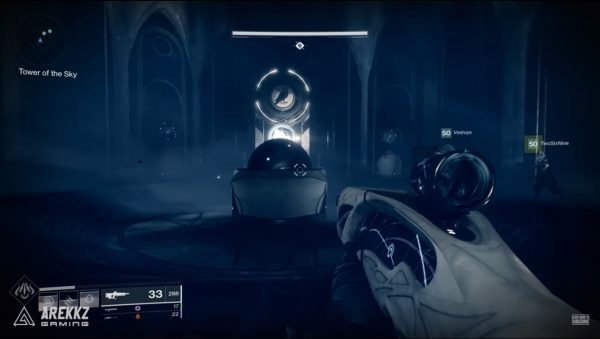 When you approach the portal, you’ll see the quest marker for The Shattered Throne, which reads: “Strike back at the curse that plagues the Dreaming City”. You’ll then be transported to Mara Sov’s throneworld and a Triumph called A Hidden Death will pop up. You have now entered Destiny 2’s first dungeon. The first section of the dungeon is linear, and you’ll be jumping from platform to platform. Keep going until you encounter the first group of enemies in the labyrinth of Erebus where you’ll fight a bunch of adds and a Labyrinth Architect. A symbol will spawn, in our video, it was of an eagle, and it’s unclear whether a different icon will appear each time. The symbol effectively represents where you need to go next, so head over to where the eagle is and fight off the next Architect. It might seem confusing at first but essentially what you’re doing is exploring the labyrinth by going to each icon location as it spawns after killing a group of enemies, so there’s a minimal amount of hand-holding to get you through it. The icons are usually mounted on the wall in a large circle, so you’ll know if you’re in the right area. Rinse and repeat this a few times until the final symbol appears and you’ll go back to the main room you first entered. The floor will open up, leading you to the next area. You’ll get a loot drop at this point which will typically be a powerful gear item. You’ll be making your way down the descent next and it’s quite linear with a few enemies. But what you want to do is follow the path down and the stairs back up. You’ll then make your way across a walkway and there will be a few Hobgoblins trying to snipe you so make use of the cover. Once you reach a dead end, head up the stairs to the left and you’ll find a room with some narrow beams. This next part is a little tricky, so send one person out part of the way on the first beam to lure the Ogres, then go back to the platform to quickly take them down. You simply need to get to the end, but there will be some Taken orbs blocking certain pathways so take your time. You’re looking for a large doorway with a black field across it. Traverse this and you’ll get the Slowed debuff, meaning that you can’t double jump. Move through the area as quickly as you can, taking care of the Taken enemies. Jump through the field at the other side and cross the chasm ahead. Again, this next section is quite linear so take care of any enemies that spawn and carry on until you encounter the first boss in Eleusinia. He’s a giant Ogre who’ll be in the middle of a room surrounded by four plates. There will also be some wizards called the Keepers of Petitions. When you kill them, they drop an orb which if you pick you’ll get a buff called Petitioner’s Mark which has a timer next to it. Once the timer hits zero, you’ll all die. The buff can be stacked and picking up a new orb resets the timer. Once you’ve collected the fourth orb, the buff will change to Petitioner’s Burden. You can then go to one of the four plates, dump the orb and that will take down the Ogre’s shields. You’ll have to do this process a few times with several damage phases. If your Power level is below 570, we recommended taking care of all the enemies except the wizards as you won’t be at the mercy of the timer. Simply start picking off the wizards once every other enemy is down. This isn’t a raid boss so there’s no Enraged mechanic so outside of the timers, you can take this fight as slow as you want. Once the Ogre has been defeated, you’ll move to a room where you can make an offering before proceeding to the final boss. There are a few lifts to go up and it’s a straightforward path to the top. A new objective will appear, which is to face Dȗl Incaru, the Eternal Return and Ba-Kuur, Fatesmith of Incaru. There is a Shield mechanic at work here. Killing the Taken Knights will see them drop an orb, Finite Thought. You can only do damage to the boss when you have this buff which is on a timer. If the timer runs out, you die, so to remove the buff you can jump on the pedestal in the middle of the room when it glows blue. Over time the Knights will get immune shields. There will be a large crystal that spawns behind the wizard that you can shoot to remove their shields. A new wave of adds will spawn, so be prepared. Once the adds have been defeated, focus back on the Knights and the boss. 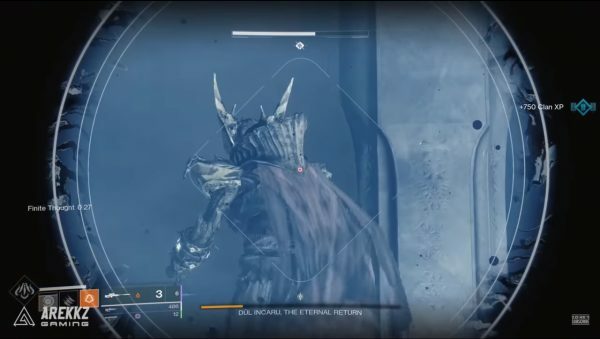 Warlocks would be wise to use their Well of Radiance here, as well as any party members having a powerful shotgun to deal damage at close range whilst in the Well, as well as a good sniper rifle. Once the boss is defeated you’ll be rewarded with some powerful gear, seemingly above the 570 Power mark. And that’s Destiny 2’s first dungeon complete! Hopefully, there will be more to come in the coming weeks. If you’re not quite powerful enough yet to take on this dungeon and are looking to boost your Power levels, check out our ultimate Destiny 2: Forsaken guide. You can check out our Gambit Prime and The Reckoning guides here, as well as our Allegiance quest walkthrough and how to get your hands on Thorn.